After an absolutely amazing March wedding in the dreary, cold, wet, gray, rainy weather in our beloved hometown of Seattle, we were more than happy to board a plane destined for the warm and sunny paradise of Atlantis. For our honeymoon we wanted to plan an amazing trip to somewhere we could relax, enjoy the sun and the beach, and experience a few adventures while we were at it. Atlantis is a resort and waterpark located on Paradise Island in the Bahamas, perched above two gorgeous white-sand beaches. The all-suite luxury resort stands in the midst of lush landscaping, shimmering waterfalls and freshwater pools. That sounded just about perfect to us. But the economic recession hit our families hard, and since we are successful 30-year-olds we really didn’t expect them to pay for our wedding, so we began saving like crazy shortly after we got engaged and covered the entire cost of the wedding ourselves. It wasn’t until we started talking about where to honeymoon that we realized we hadn’t set aside additional funds for the trip, and since it was meant to be a celebration of the most important day in our lives, we really wanted to do something big… but without starting our marriage in massive debt. Traveler’s Joy was the perfect solution! This would be our first real adventure as husband and wife, with a lifetime of memories that will last a lot longer than a new set of wine glasses (especially at my breakage rate!). Plus, since we’ve been living on our own for a while, we have been lucky enough to accumulate a lot of the “essential” home items a newly married couple needs. So our Traveler’s Joy registry was a way for our friends and family members to help make our perfect honeymoon come true. They were able to purchase actual honeymoon activities for us to enjoy on our trip, releasing us of the guilt of having to swipe the credit card over and over again. Everyone was amazingly generous and we departed for the airport on Monday morning following our wedding madly in love and without a care in the world. Flying to the Bahamas from the Pacific Northwest is no picnic, especially if you want to get there in one day. We worked with Mountain View Travel to book our trip, and although the agent did everything she could, we ended up having to fly from Seattle to Dallas to Miami to Nassau, finally arriving at Atlantis just before midnight local time on Monday night (3:00 AM PST). Needless to say, we were absolute zombies by that point. We weaved our way through groups of giggling, scantily clad high school spring breakers on their way to and from the various hotel night clubs until we eventually checked in and found our room, where we didn’t even bother to unpack before tumbling into bed. We awoke the next morning with our exhausting travel day behind us and nothing but paradise on earth to look forward to. I immediately wanted to go out exploring, and we took a leisurely stroll along walkways that wound underneath palm trees and around lagoons filled with colorful wildlife and crystal clear pools full of happy sunbathers. Finally, finally, our feet hit the beach and we kicked off our sandals and ran toward the cool blue waters of the Atlantic Ocean. As the warm, gentle saltwater touched my toes, tears welled in my eyes. “What’s wrong? !” Stewart exclaimed. “I just can’t believe we’re finally here,” I explained. And by here, I meant standing hand in hand in paradise with my husband, a place I plan to be in for the rest of my life. Once we got that emotional outburst under control, we were ready to take on the day. We chose Atlantis for our honeymoon because we are into adventure – we wakeboard, surf, snowboard, skydive, and bungee jump. Not to say we aren’t madly in love, but sitting around for a week on a beach staring into each other’s eyes seemed about as dull as watching the home shopping network, so we wanted to go someplace exciting! The TV commercials for Atlantis make it look like Disneyland for adults, and they do not exaggerate! Every single day we spent at least some time at the 141-acre Aquaventure Water Park, an aquatic thrill ride featuring over 20 million gallons of water, Atlantean-themed towers, high-speed water slides, a mile-long river ride with rolling rapids and wave surges, 20 swimming areas, and 11 unique swimming pools that are all connected by a lush tropical environment. I think we rode every single water slide at least once each day, especially The Leap of Faith, which has a 60-foot almost-vertical drop from the top of an iconic Mayan Temple through a clear tunnel submerged in a shark-filled lagoon! We also never missed the mile-long Current River Ride, an inner tube ride through tropical foliage along water escalators, rolling waves and extreme rapids. And whenever we needed a break from the rides, we would hang out in one of the many pools or plant ourselves on a couple of poolside lounge chairs to enjoy the tropical sunshine and tan our poor, pale, Seattle skin. We love animals, so we were very excited that our first activity was a Sea Lion Interaction. We got to wade waist-deep with an adorable curious sea lion that we hugged, played with, and even kissed! We also got to explore the Bahamas’ first dedicated marine animal rescue and rehabilitation facility on a behind the scenes tour to see how the sea lions and dolphins are fed and cared for. The next day we did a Deep Water Dolphin Swim, something that has been on both our bucket lists our entire lives. In the crystal blue waters of Dolphin Cay lagoon we got to glide alongside dolphins using hand-held water scooters and fins. 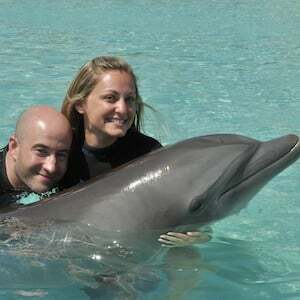 The best part was the “foot push,” when each of us was propelled by a dolphin across the entire pool! 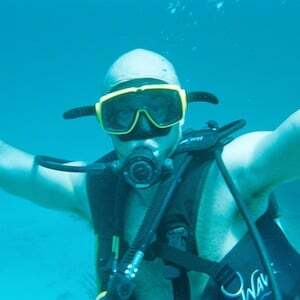 Stewart has always wanted to scuba dive, so we made sure to sign up for lessons followed by a deep water ocean dive. 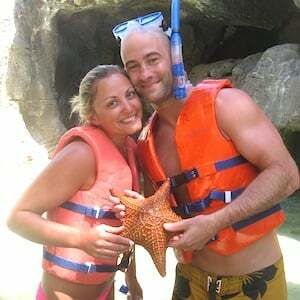 Unfortunately, I suffer from severe claustrophobia and can barely even snorkel, but I was determined to conquer my fears and enjoy this experience with my husband. Ten minutes into the pool lesson I was already in tears, and panic soon overwhelmed me to the point of total meltdown. But a kindly instructor took pity on me and proceeded to give me a private lesson, and I somehow managed to obtain my temporary certification. Later that afternoon we hopped on a boat in the marina and were soon anchored in the ocean off the coast of an adorable little island adorned with an ancient lighthouse. We also did the Atlantis Stingray Experience, a hands-on encounter with hundreds of Cownose stingrays and colorful, tropical fish. We got to hand feed the rays in a shallow lagoon and then snorkel alongside them. After the scuba diving mishap, snorkeling seemed like a breeze, and later we had a fantastic time on our Snorkel Atlantis adventure in the Ruins Lagoon. It contains artifacts inspired by ancient Atlantis and is home to more than 20,000 deep reef and pelagic fish. We snorkeled through the 2.7 million gallon marine exhibit right above rare sleek sharks and rays. We even swam over a 14-foot Manta ray… absolutely a once-in-a-lifetime experience. Most days, at some point, we would make our way down to the postcard-perfect beach. We loved alternately sitting with our feet in the sand and going down for a quick swim in the refreshing ocean waters. One afternoon at the beach we decided to try parasailing, which was a terrifying thrill and one of our favorite memories from the trip. One thing we noticed right away about the Bahamas in March was the amazing weather. Every day it was blinding sun and blue skies with occasional white puffs of perfect clouds in the distance. The temperatures hovered in the high 80s with very little humidity, with only light breezes and occasional quick showers at night (we would see evidence of these in the morning). And amazingly for a tropical island, we never saw a single insect! We were determined to soak up as much paradise as possible while we were there, so we didn’t spend a whole lot of time indoors. However, Atlantis does have a plethora of amenities including a movie theater, game room, spa, fitness center, casino, and comedy club. There is also tons of shopping, casual and fine dining, nightclubs, bars and lounges. And all throughout the resort everywhere you turn there are underwater aquariums filled with amazing displays of tropical fish and aquatic animals. We were usually so tired after spending an entire day in the sun that we would most often just grab dinner and head back to our room for the evening, blissfully sun kissed, relaxed, and content. * Do stay at the Atlantis Beach Tower, which is the most value-priced hotel at the resort. But it is still very clean and comfortable and it had everything we needed, including a luxurious king sized bed. Our room even had lovely little balcony with a gorgeous view of the beach and turquoise waters. * Don’t purchase the Atlantis Value Dining Meal Plan unless all you want to do on your trip is eat. We thought this would be a great investment, but in hindsight it was a waste. We often found ourselves stressing about our next meal, because we didn’t want to “waste” any of the pre-purchased plan. So we would get dressed and walk back from the pool to eat in a specific restaurant that was part of the plan, when we would have been happier just grabbing a burger by the pool. * Do bring your own alcohol! Drinks at Atlantis can add up quicker than you can imagine, so arrive prepared. We brought a case of beers (cans) and three bottles of hard liquor in our checked luggage, and every day we would bring some of it with us down to the pool. This probably saved us hundreds of dollars. * Don’t drink the coconut cocktails from the guys dragging coolers along the beach! We thought this would be a great idea until we accidentally got blackout drunk one afternoon from some moonshine concoctions a local sold us. This might seem obvious, but when you’re on the beach in paradise and someone offers you a drink in a real coconut, it seems like the most amazing idea ever. * Do understand that many of the excursions and activities do not allow personal cameras or photographs to be taken. Instead, the big moneymaker is to have professionals photograph you having the time of your life, and then offer very expensive photo packages while you’re still pumped with adrenaline. We felt like we couldn’t live without the amazing pictures (they’re pretty awesome), so we always bought the photos. We spent several hundred dollars on all the packages; they are not cheap! So be sure you budget it in if photos are your thing. * Don’t wait to book your activities. Not many can be purchased in advance, so be sure to make reservations as soon as you arrive because popular activities sell out quickly. * Do keep in mind that if you’re not as active as us and don’t want to do every single activity available, you can save a lot of money just spending your days at the water park or at the beach, which are both absolutely fantastic. * Don’t worry about the resort being filled with little kids, or teenage spring breakers. We were kind of concerned that this might be annoying, but there are plenty of places for adults to enjoy themselves without little ones putting a cramp in your style. And it was kind of fun seeing the kids get such a thrill on the rides. * Do print some of your photos when you get home and include them with your thank you notes. Everyone who bought us honeymoon activities through Traveler’s Joy thought it was really cool, unique and thoughtful that we included photos of our adventures with our thank yous. Our honeymoon adventure cost approximately $7,500 including airfare, but in our opinion money is best spent on memories, not material items, so it was worth every penny. We are so happy that we chose Atlantis for our first trip as husband and wife, and hope to take our future family back there one day!